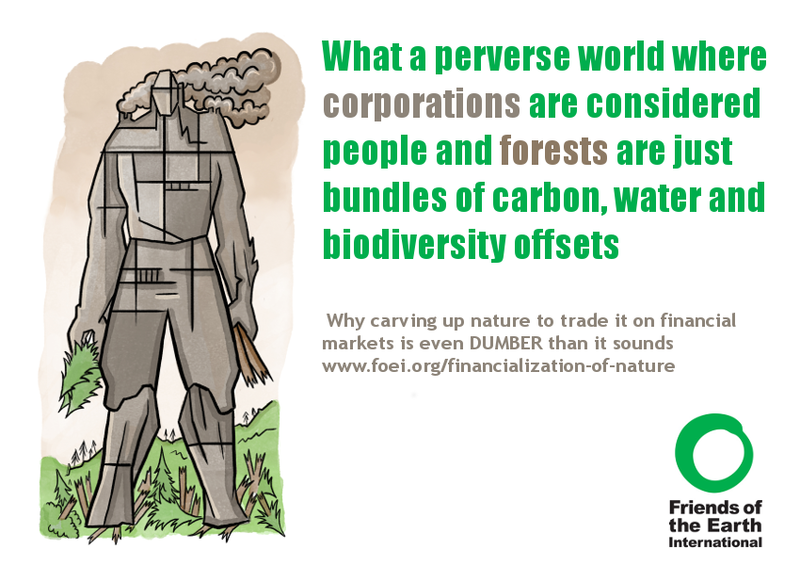 I was asked by Friends of the Earth International to create a set of images to accompany a recent report they produced about the ‘Financialization of Nature’. It was very much a collaborative process, with much input from their side, as they were keen that the final result should be immediately visually impactful, and move people to read further and engage with the topic. The pallet used was bright and the imagery bold, to match the overall look and feel of their campaign design. 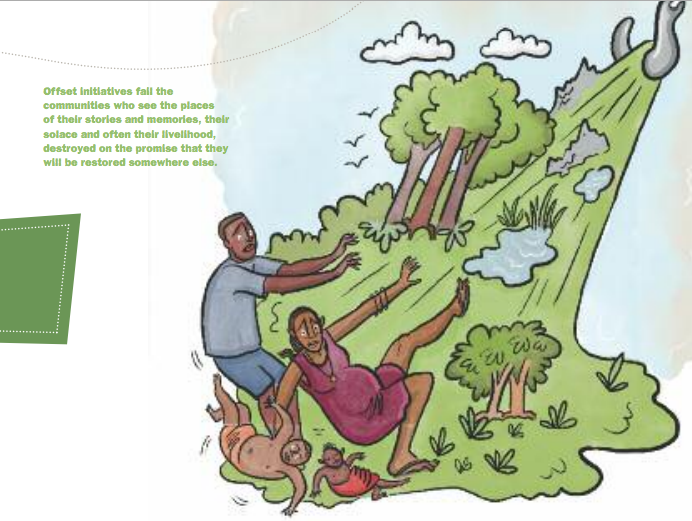 ‘Financialization of Nature’ is a very scary thing. We are assured that governments are restricting the damage that corporations can do to the environment through a ‘biodiversity offsetting’ system. This essentially means that if one area of the nature is destroyed, another area of the same size must be established elsewhere. Sounds OK on paper, but in reality this practice is pretty much meaningless. Ancient forest, rich in biodiversity, habitat for infinite species of animal, plant, fungus and bacteria can, under this system, be destroyed and replaced by grassland or young trees – the rich, old land replaced by young land that can support little life. Not to mention that there can be huge gaps in time and place. The new land need not be created immediately, nor does it have to be close to the old. What happens to the life that lives on the land that is destroyed? There is no half-way house for it to dwell in while it waits for a new habitat. It dies, long before the new habitat is created – a habitat that is too distant and too simple to support it anyway. And in many cases, with very few organisations policing the system, the new land is never created at all. Because the wheels of Capitalism spin on and on faster and faster, brilliant minds have concluded that the natural world will only be saved if we treat nature as a commodity, just like everything else. 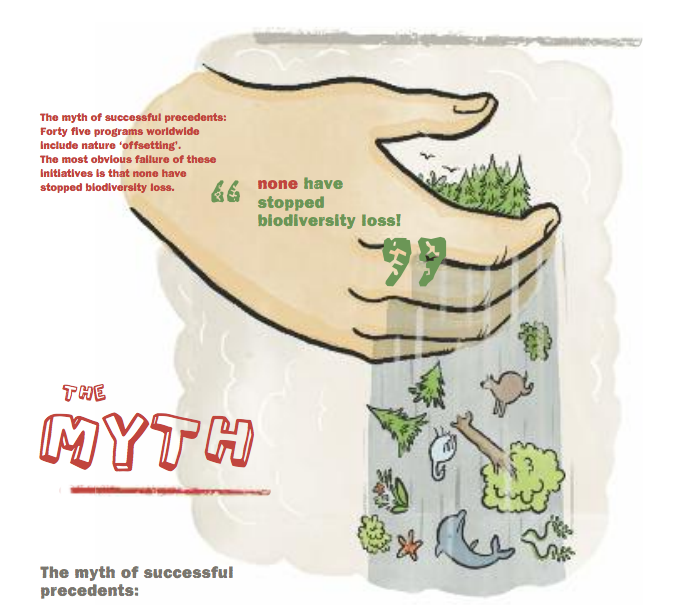 Forests, rivers, wetlands etc are rebranded ‘Ecosystem Services’ to be bought and traded. Nature is carved up into pieces in order to give it ‘worth’ to corporations who might otherwise destroy it. But nature is one system, a synergy, each element depending on another. Some easily tangible elements are given value – carbon, water, peat, whilst other more nebulous ones are not. A company can destroy 1000 trees in one area and replant them in another, but what happens to the millions of lives, the indigenous peoples, the delicate, intricate ecosystems what lived surrounding those trees?The company washes its hands and walks away with ‘clean conscience’. We must attempt to change things for the better – but we must also recognise a scam when we see one. This system does little to prevent biodiversity loss. For those who feel guilt, it helps alleviate it and for those who feel none, it turns nature into two things: commodities to be bought and irrelevancies to be ignored. As a species we are used to using our surroundings for our own ends. We see short term comfort and ignore long term ruin. As our world becomes more difficult to live in, will be change our ways? Will we change in time? After so long at the top, perhaps it is not possible to think differently. Perhaps success relies on appealing to our inner capitalist, but it also relies on us telling the truth about what works and what doesn’t, facing our guilt and pushing to find a real solution.